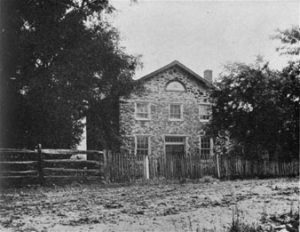 The building that later became Faith Reformed Church was erected around 1850 by Francis Thomas, Governor of Maryland from 1842 to 1845, to be used as a town hall for the village of Petersville. Little is known about the first 10 years when this building was used as a town hall. The two-story stone building resembles other contemporary hall-plan churches found in many rural areas. Methodist Episcopal Church trustees purchased the building from Mr. Thomas in 1860 for $150 and it served that congregation until the early 1890s. At that time, this edifice was purchased by the Reformed Church from the Methodist Episcopal Church for a fee of about $300. Prior to purchase of this church from the Methodist Episcopal Church, the Reformed members in and about Petersville worshipped in the Lutheran Church, and were supplied by the pastor at the Reformed Church in Burkittsville. Renamed Faith Reformed Church of Petersville, it was formally organized in August 1903, by W. S. Fisher. This church operated as such until 1938, at which time it was sold then converted into a private residence.